the third one hates us and tries to pull us down . . .
Stello (1832) is the story of the artist’s ongoing struggle against society under a variety of political systems. 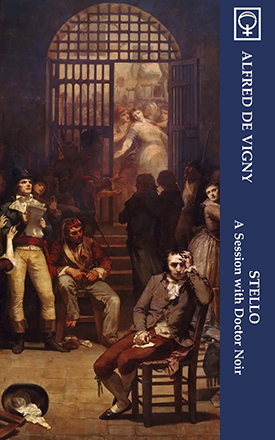 In this classic French novel, the despairing poet Stello consults the mysterious Doctor Noir in the hopes of being cured of the “blue devils” which torment him. Stello fears he has no choice but to devote his artistic talents to some utopian political ideal; in the hopes of dispelling his delusions, the Doctor recounts the story of three historical poets: Nicholas Gilbert, Thomas Chatterton and André Chénier, each of whom similarly came to grief in the different societies in which they found themselves. The Doctor’s final sobering prescription for Stello’s woes can be seen not only as a way forward for the novel’s protagonist, but also as surprisingly relevant words of caution for the artist of today. Irving Massey’s translation introduces an important French text to those who are unable to read the original version and are nevertheless interested in French literature, in Romanticism, or in the history of prose fiction. The translation is remarkably faithful to the French text; the subtleties of Vigny’s irony are preserved, and the various narrative dictions―which range from dispassionate commentary to impassioned outbursts―are reproduced with accuracy and sensitivity. For this new edition, Dr. Massey has added an addendum to his original introduction and expanded the notes; also included is a short bibliography of Vigny studies undertaken since this translation was first published in 1963.